1950: Detroit population: 1,850,000. Regional population: 3,350,000. 1954: Northland mall opens in Southfield, the first regional shopping center. 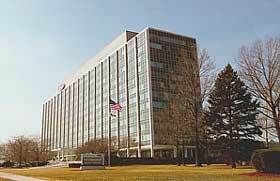 1956: Ford builds new headquarters in Dearborn. 1956: A water plant in northeast Detroit opens as the burgeoning suburbs decide it is cheapest to tie into Detroit's pipes. By allowing the new communities to join the system, Detroit officials encourage the exodus from the city. 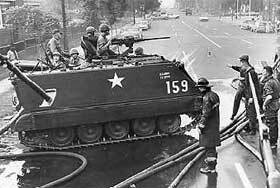 1956: The Federal-Aid Highway Act paves the way to the suburbs. It's a system of 41,000 miles of interstate highways constructed with 90 percent federal funds. 1956: General Motors begins moving workers into Warren Tech Center. The new facility consists of research, engineering, design, environmental, manufacturing and testing areas as well as headquarters for several GM divisions. 1957: Eastland Mall, patterned after Northland, opens in Harper Woods. 1959: Kern's department store in downtown Detroit closes. 1960: Detroit population: 1,670,000. Regional population: 4,180,000. 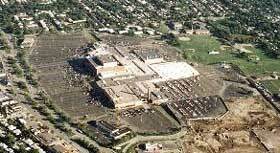 1965: Westland Mall opens; unlike Northland and Eastland, shopping center is enclosed. 1968: City's income tax doubles to 2 percent for Detroiters. 1970: Detroit population: 1,510,000. Regional population: 4,740,000. 1971: U.S. District Judge Stephen Roth orders cross-district busing, but it is overruled by the U.S. Supreme Court. A Detroit-only busing plan was ordered in 1975, but by the time the plan was to go into effect in 1976, there were too few whites in the district to effectively integrate. Still more white parents pull their kids out of the schools and moved to neighboring cities. 1971: Catholic Archdiocese closes 62 schools. 1972: Kmart Corp. moves headquarters from Detroit to Troy. 1972: Jeffries Freeway, Interstate-96, opens. 1974: Coleman A. Young becomes the city's first black mayor, and white flight continues. 1975: The Pontiac Silverdome opens, and hosts the Detroit Lions and Pistons as well as rock concerts, religious rallies and tractor pulls. 1980: Detroit population: 1,200,000. Regional population: 4,680,000. 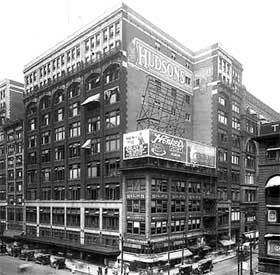 1983: Hudson's closes its flagship store, ending 102 years downtown. 1988: The Palace of Auburn Hills opens as the new home of the Pistons. 1989: 27 Catholic churches close in Detroit, the largest mass closing of Catholic churches in U.S. history. 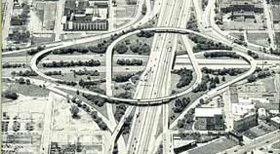 1989: Walter Reuther Freeway, I-696, becomes major east-west corridor. 1990: Detroit population: 1,030,000. Regional population: 4,590,000. 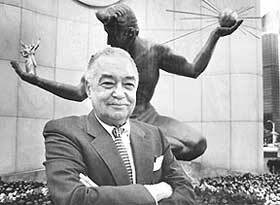 1991: Chrysler Corp. headquarters moves from Highland Park to Auburn Hills. 1992: Governor's commission calls lack of coordinated planning a major environmental threat. 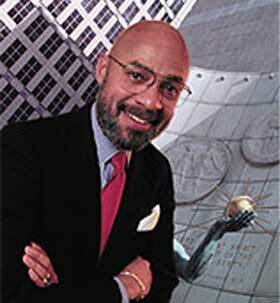 1993: Detroit Mayor Dennis Archer takes office, promising downtown redevelopment and an era of cooperation with suburbs. 1994: Republican caucus in state House draws up 21-point plan for improving planning and growth management. Eight years later, little has been implemented. 1994: Detroit voters pass $1.5 billion to repair deteriorating schools. It is the largest bond issue in state history. 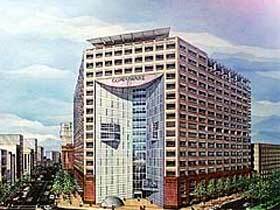 1996: Compuware announces plans to move world headquarters from Farmington Hills to downtown Detroit. 1996: Michigan raises gas tax to pay for crumbling roads and freeways. 1999: Casinos open in Detroit, drawing some suburbanites back downtown for the first time in a generation. 2000: Detroit population: 950,000; Regional population: 4,740,000. 2001: 30-year fixed mortgage rates fall under 6.5%, the lowest rates in 30 years. 2001: African-American Brenda Lawrence is elected mayor of Southfield, signaling suburbanization of black political power. 2001: Planning reform stalls in Michigan Legislature. 2002: Formerly rural South Lyon, Brighton and Howell are combined in a new federally designated urban area. "I found it possible, when walking around most parts of Detroit's downtown, to imagine I was the only white person in the city. Occasionally another white person would pass by in a car, but I rarely encountered them on the street. Most people I passed viewed me with a curious glance and were invariably friendly and helpful when I talked to them. I have never experienced a city as segregated as this. 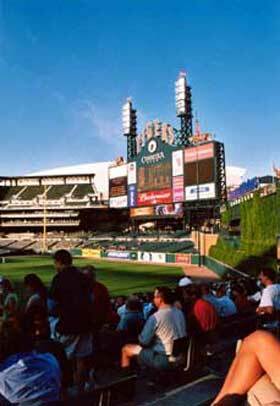 One evening I went to see a Detroit Tigers baseball game at their new stadium Comerica Park. 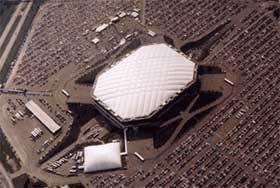 Built over several blocks of land in the heart of downtown, this huge stadium can seat over 60,00 people. On the night I went, there were more like 10,000 - the Tigers are struggling at the moment, plus it was only a friendly match. However I was immediately struck by the fact that the crowd was almost exclusively white. On game nights the numerous vacant lots in this portion of the downtown are flooded with the cars of whites from the suburbs, who go straight to the stadium, and leave directly afterwards. 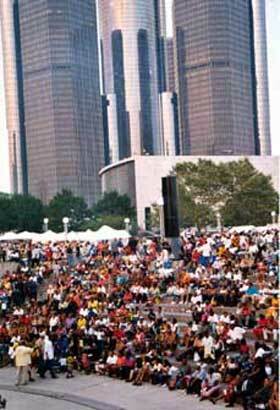 The next evening I went down to Hart Plaza on the riverfront to join the large crowds enjoying the Annual Caribbean festival. Once again I was struck by the racial composition of the crowd - this time overwhelmingly black. I enjoyed the music, the stalls and the evening sunshine, before walking back to the hotel. I could count number of white people I saw during the evening (excluding police) on one hand. Surely this is the cities crucial crisis, not the blocks of derelict skyscrapers"